You are encouraged to enroll multiple factors (a smartphone plus a work or office landline, for instance) to enable planned self-service support of your factors down the road. You may enroll from any computer, and you will need the following during the enrollment process. Gather these things now to make registration easier. The last four digits of your Penn State University unique identification number, which is printed on the back of your PSH identification card or may have been distributed to you. 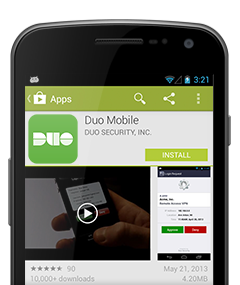 If you have a smartphone or tablet, install the Duo Mobile app. Without it you'll still be able to log in using a phone call or text message, but the Duo Mobile app is the most convenient way to do so quickly and easily. 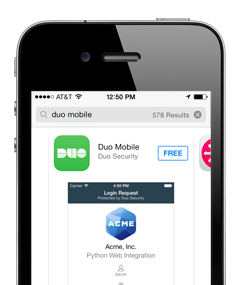 Launch the App Store app and search for “Duo Mobile”. Important: Duo Mobile is not "iPad optimized". By default, Apple only shows iPad optimized apps in the App Store. You will need to select "iPhone Apps" in the upper left corner if you are trying to download Duo Mobile on an iPad. Tap “Free” and then “Install” to download the app. Note: Tap “OK” when asked if Duo Mobile should be able to send push notifications. Launch the Google Play Store app and search for “Duo Mobile”. 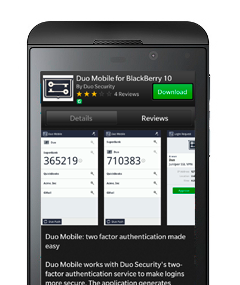 Search for “Duo Mobile” in BlackBerry World. Tap “Download” to install the app. 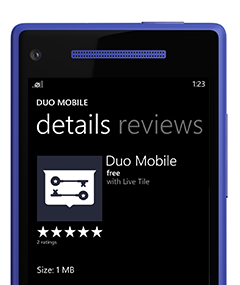 Search for “Duo Mobile” in the store. SMS: a six digit passcode will be sent via text message to your mobile phone that you enter during the login process. Voice Prompt: your mobile or land line will be called, and a voice will prompt you to push any key on your touchtone phone to approve the login attempt.